MINERVA is to give students a better understanding of how particle detectors work and the physics that they study. Currently, in MINERVA, students are able to study W and Z boson events by observing their decay products and apply this knowledge to search for the Higgs boson. Students can also search for the decay of neutral hadrons by searching for oppositely charged pairs of tracks originating from a vertex displaced from the main interaction. The primary aims of the lab are: The aim of MINERVA is to give students a better understanding of how particle detectors work and the physics that they study. Currently, in MINERVA, students are able to study W and Z boson events by observing their decay products and apply this knowledge to search for the Higgs boson. 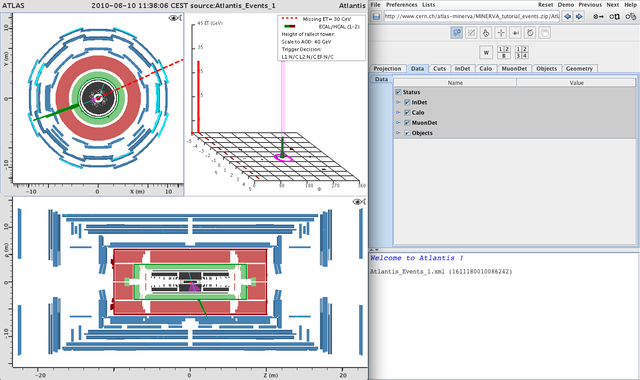 Students can also search for the decay of neutral hadrons by searching for oppositely charged pairs of tracks originating from a vertex displaced from the main interaction.